(Simeon Buckley is a master’s student from RMIT University (Melbourne, Australia) and is working as a research assistant to Anna Stammler-Gossmann on a research project – Coastal communities of the Barents region and marine resources use: Seascape and fishing rights. I chose the topic of kangaroo harvesting as it is an interesting comparison to traditional fishing rights of coastal Sami people. I would like to write my masters thesis on the topic of indigenous involvement in kangaroo harvesting and developing fair trade kangaroo products. I opened the presentation with a two quote that highlight the environmental difference of Australia compared with Europe. Kangaroos are one of the most numerous large wild animal species in the world. “The combined population size of the four species of kangaroo that are commercially harvested in Australia fluctuates between 15 and 50 million animals over the past 25 years in the harvested areas, depending on seasonal conditions such as drought.” (Department of Foreign Affairs and Trade 2013) The four species of kangaroo that are commercially harvested have very large populations. None of these species is threatened or endangered. Pastoral activities in much of the Australian arid rangelands are supporting a large population of kangaroos which, if uncontrolled, would seriously threaten the economic viability of the pastoral industry and the environmental sustainability of huge tracks of land (Caughley et al 1987 in Kelly 2008). The harvesting of kangaroos is permitted on a quota basis that is reviewed annually and independent of market demand. Quotas are set on the basis of population size and trends, and long-term climate predictions. An average of 3 million kangaroos is harvested each year. The Conservation of the species remains the foremost consideration. This approach ensures that the harvesting of kangaroos is managed in an ecologically sustainable way. (Department of Foreign Affairs and Trade 2013). The Australian kangaroo industry estimates that it exports kangaroo meat to more than 55 countries. The European Union and Russia are the most significant export markets. 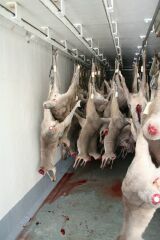 (Kangaroo Industries Association of Australia 2013) In 2009 Russia accounted for 70 % of export trade of kangaroo products before a ban that has now been lifted was put in place preventing the import of kangaroo meat due to potential hygiene issues with the meat. The commercial harvesting of kangaroos could provide significant economic basis for maintaining traditional culture. 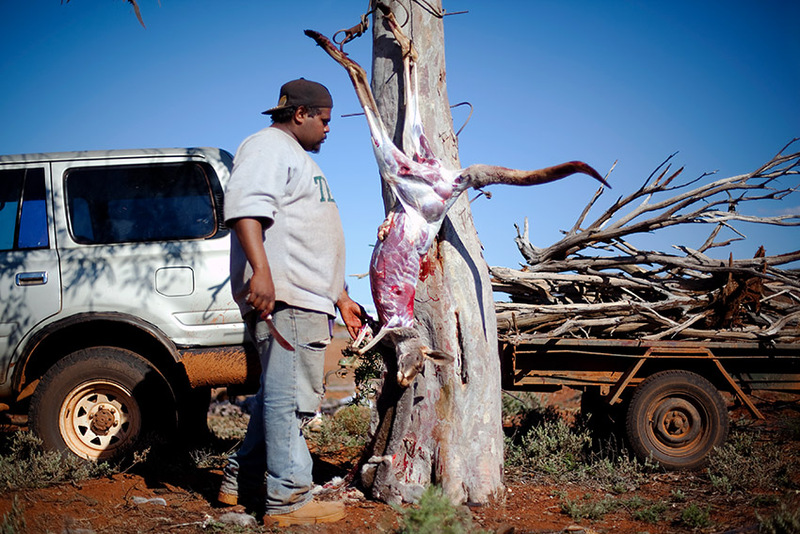 Currently there is minimal participation of indigenous people in the kangaroo harvesting industry. Davies et al. (1999) says that, although widely recognized as ecologically sustainable, the commercial harvest of kangaroos is not yet demonstrating social dimensions of sustainability. There is a lack of consideration of social and cultural issues in general. (Davies et al. 1999) Kangaroos are of cultural, social and spiritual significance to Aboriginal people. Aboriginal have people have a diversity of views about the appropriateness of killing kangaroos. In a number of communities or language group’s particular species of kangaroos hold such significant cultural value that the commercial hunting of kangaroos is culturally unacceptable and inappropriate. For some communities the hunting of kangaroos was inappropriate in some sacred places and expectable in other areas. If the industry actively employed and incorporated the interests of indigenous people it could became a way of providing meaningful employment and economic support for some of the most disadvantage people in Australia. Indigenous Australians as a group generally experience high unemployment compared to the national average. This can be correlated to lower educational outcomes. As of 2002, the average household income for Indigenous Australian adults was 60% of the non-Indigenous average. (Australian bureau of Statistics 2010). There is very little indigenous involvement in the Kangaroo Industry in Australia and there are currently no programs or policy to help Indigenous people became involved in the industry. There are significant opportunities for the development of the kangaroo harvesting industry in culturally appropriate ways. With targeted development of the industry designed to provide economic bases for maintaining indigenous communities and economic means to insure ongoing traditional practices. Involvement of aboriginal people in the kangaroo industry may also help to resolve some of the outstanding social problems indigenous communities have. There are a number of market mechanisms that could be used such as, giving indigenous people rights to a percentage of the quota for the kangaroo harvest. Developing micro finance loan schemes that would help indigenous people can afford the startup costs of the industry and developing culturally appropriate training programs and licensing systems. There are significant opportunities for further research on this subject and it would be interesting to compare Sami and Inuit experiences with the development of natural resource harvesting industries. • Australian Institute of Aboriginal And Torres Strait Islander studies (2011) The Benefits Associated With Caring For Country. The Department of Sustainability, Environment, water, Population And Communities Australian Government. • Caughley, G.J., Sheppard, N and Short, J. (1987). Kangaroos, their ecology and management in the rangelands of Australia. Cambridge Uni Press. • Garnett, S and B Sithole 2007 Sustainable Northern Landscapes and the Nexus with Indigenous Health: Healthy country, healthy people, Land and Water Australia, Canberra. • Hargroves, K & Smith, M 2005, The natural advantage of nations: business opportunities, innovation and governance in the 21st century, Earthscan, London. • Landsburg, J (1999). The effects of artificial sources of water on rangeland biodiversity. CSIRO Div. Wildlife and Ecology, Biodiversity Technical Paper no 3. • T. Flannery (2008), Now or Never: A sustainable future for Australia. Quarterly Essay. • Thompson and Davis (2007) People and the Kangaroo Harvest in the South Australian Rangelands. Rural Industries Research and Development Corporation. This entry was posted in All, Indigenous Peoples and tagged Australia, hunting, Kangaroo, marketing. Bookmark the permalink.